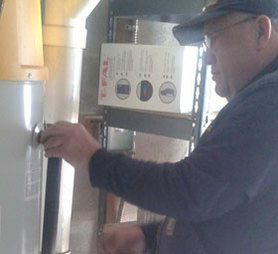 Let us deal with the process of moving your new water heater and hooking it up in your home. All you&apos;ll have to do is sit back, relax, and let the experts at Al&apos;s Water Heater Sales & Service handle everything. Contact us today for a FREE estimate. Getting rid of an old appliance can be difficult and time consuming. We&apos;ll get rid of your older model for FREE. You&apos;ll get quick installation of your commercial and residential heater. In addition, you can choose from name brands like Bradford White and A.O. Smith.